It turns out that the world’s biggest sinkhole in Belize is no stranger to plastic bottles and pollution. The discovery was made at the end of last year, when British entrepreneur and billionaire Richard Branson led a diving expedition into The Great Blue Hole and found plastic at the bottom of the giant abyss. Branson was part of the first-ever submersible dive to the bottom of the Great Blue Hole, accompanied by Fabien Costeau, who is grandson of French explorer Jacques Cousteau, and National Geographic explorer Erika Bergman. Newsweek reported that Branson said the discovery of plastic bottles in the giant sinkhole showed the great need to “get rid of single-use plastic”, adding that it had become the “scourge of the ocean”, according to one of his blogs recounting the trip. The Great Blue Hole, located just 100 kilometers off the coast of Belize, is almost 300 meters across and 125 m deep. 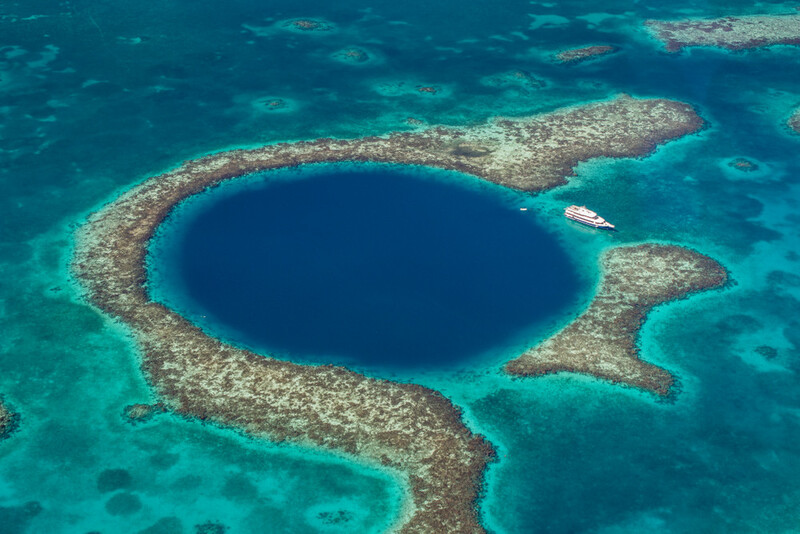 The massive underwater sinkhole was made famous when Jacques Cousteau explored it in 1971, declaring it one of the top five scuba diving sites in the world. It is part of the UNESCO World Heritage Site -- the Belize Barrier Reef Reserve System (BBRRS). According to Newsweek, the Great Blue Hole formed as a limestone cave hundreds of thousands of years ago, when sea levels were far lower. At the end of the last ice age, sea levels rose by around 100 m, submerging the cave to become the natural wonder it is today. Throughout the dive, Branson broadcasted the journey on the Discovery Channel while keeping a blog. He described the Giant Blue Hole’s massive wall of giant stalactites as “breathtakingly beautiful”. “The Blue Hole is made of a complex system of caves that once formed on dry land. It is proof how oceans can rise quickly and catastrophically. “At 300 feet down, you could see the change in the rock where it used to be land and turned into sea. It was one of the starkest reminders of the danger of climate change I’ve ever seen,” wrote Branson. He also described the thick layer of hydrogen sulphide that the three divers eventually reached on their dive. Further down, there was a pile of creatures that had fallen into the hole and died due to lack of oxygen. “As for the mythical monsters of the deep? Well, the real monsters facing the ocean are climate change -- and plastic. Sadly, we saw plastic bottles at the bottom of the hole, which is a real scourge of the ocean. “We all have to get rid of single-use plastic,” he said, expressing his concern for the sustainability of the future.